An original letter of correspondence between brothers and business partners Joshua Coffin Chase and Sydney Octavius Chase. Topics discussed in the letter include cutting the labor force and wages at Isleworth Grove, low citrus prices, and the overall state of finances of Chase & Company. 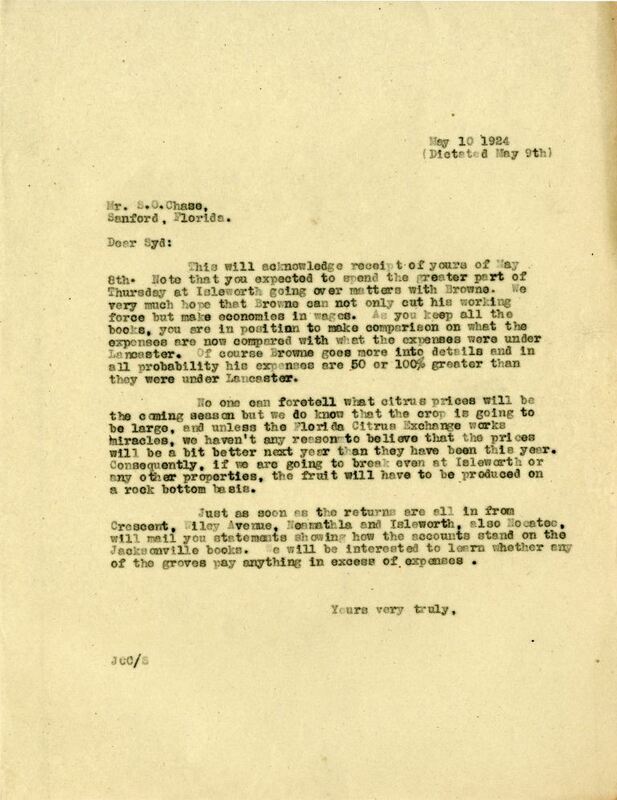 Original letter from Joshua Coffin Chase to Sydney Octavius Chase, May 10, 1924: box 49, folder 20.84, Chase Collection (MS 14), Special and Area Studies Collections, George A. Smathers Libraries, University of Florida, Gainesville, Florida. Digital reproduction of original letter from Joshua Coffin Chase to Sydney Octavius Chase, May 10, 1924. "The History of Seald-Sweet." Seald Sweet International. http://www.sealdsweet.com/welcome/our-history.php. This will acknowledge receipt of yours of May 8th. Note that you expected to spend to spend the grater part of Thursday at Isleworth going over matters with Browne. We very much hope that Browne can not only cut his working force but make economies in wages. As you keep all the books, you are in position to make comparison on what the expenses are now compared with what the expenses were under Lancaster. Of course Browne goes more into details and in all probability his expenses are 50 or 100% greater than they were under Lancaster. No one can foretell what citrus prices will be the coming season but we do know that the crop is going to be large, and unless the Florida Citrus Exchange works miracles, we haven't any reason to believe that the prices will be a bit better next year than they have been this year. Consequently, if we are going to break even at Isleworth or any other properties, the fruit will have to be produced on a rock bottom basis. Just as soon as the returns are all in from Crescent, Wiley Avenue, Neamathla[?] and Isleworth, also Nocatee[? ], will mail you statements showing how the accounts stand on the Jacksonville books. We will be interested to learn whether any of the groves pay anything in excess of expenses. Chase, Joshua Coffin. 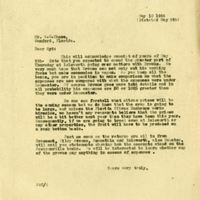 “Letter from Joshua Coffin Chase to Sydney Octavius Chase (May 10, 1924).” RICHES of Central Florida accessed April 22, 2019, https://richesmi.cah.ucf.edu/omeka/items/show/2732.